Cookies are small pieces of data (text files) that a website – when visited by a user – asks your browser to store on your device in order to remember information about you, such as your language preference or login information. The cookie will be used to recognize you and your preferences the next time you visit the site. In Settings > Privacy > Cookies you can decide whether you want to accept all cookies, only allow them for the current session or never accept them. When First-Party Cookies are set by the website you see in the address field, then Third-Party Cookies are set by other domains. These cookies may be used for showing content from other domains (for example, an embedded YouTube video), advertising (to show you ads based on your browsing habits), etc. To block all third-party cookies, open Settings > Privacy > Cookies > Third-Party Cookies and tick the box for Block Third-Party Cookies. Note! Blocking cookies can cause a website not to work properly if the website uses multiple domains for their content. In Settings > Privacy, you can also enable the option Ask Websites Not to Track Me. It’s a polite way to ask websites not to set tracking cookies. However, they can simply ignore it, and in most cases, the ones you want to avoid will be the ones who do not respect your request. One option to delete all cookies is to clear the browsing data. From the browser menu select Tools > Delete Browsing Data. Pick the time frame and make sure the Cookie option is selected. Alternatively, go to Settings > Privacy > Cookies. There you can view all the saved cookies by clicking on Display Saved Cookies. You can also filter them by domain. To delete all cookies, click on Delete All Cookies. 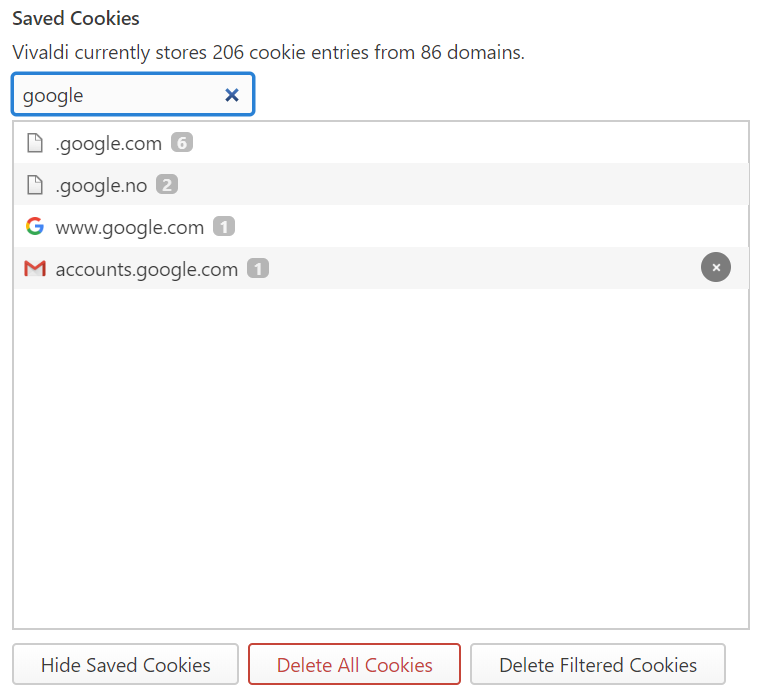 To delete all cookies by the same domain, filter them out and click on Delete Filtered Cookies. To delete a single cookie, hover the mouse cursor over it and click on X that appears on the right side. Click on the Site Info button on the Address Bar and select Cookies from the menu. In the pop up window, select a cookie and click on Block/Allow to move it to the other category.